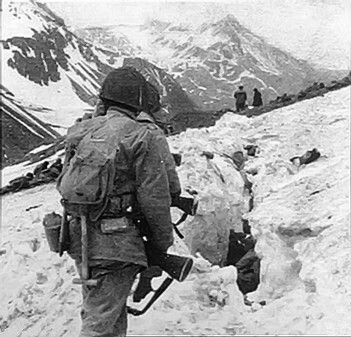 US troops navigate snow and ice during the battle on Attu in May, 1943. Public domain as Crown copyright lasts 50 years in Australia. The Australian War Memorial, which holds this photo, has stated that this image is in the public domain and that its copyright has expired.